A microSD card can be used for saving MP3 data, and also to capture your mini KAOSS PAD 2 performance into the master recorder as WAV format data. Once you&apos;ve found the perfect way to apply an effect, you can use this function to record your idea. This is a convenient way to share mini kaoss pad 2 performances on the Internet. 6 preset audio demo loops are stored in the internal memory. These demo loops provide a handy audio source that can be used to immediately audition the various effect programs, without having to hook up an external audio player, or before any audio data or MP3 files have been stored on to a microSD Card. 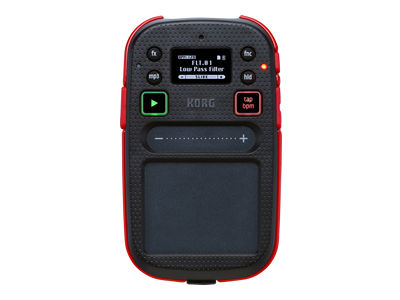 The mini KAOSS PAD 2 features a comfortably curved body that makes it both stylish and extremely easy to play. The high-contrast OEL (Organic Electroluminescent) display clearly shows the names of the sounds, features, and parameters, and ensures excellent visibility, even in a dimly lit DJ booth or stage. As with the touchpad, the VALUE slider is also touch-sensitive. By sliding or tapping your finger (as appropriate for each function), parameters and functions may be controlled smoothly. Lightweight and compact, the mini KAOSS PAD 2 is slim enough to fit easily in your hand or pocket. The energy-efficient design allows it to operate everywhere on just two AA batteries. Equipped with a built-in speaker, the mini KAOSS PAD 2 is ready to share your exciting sonic creations wherever your music takes you. The headphone output provides privacy for playing and experimenting alone, and can also be used to connect the mini KAOSS PAD 2 to another audio device.